The AI in these games is more prescient than ever. EA Sports has a pretty amazing record when it comes to predicting the outcome of major sporting events. The company used it's FIFA 18 game to correctly opine that Germany would win the 2014 World Cup, and has used the long-running Madden franchise to correctly guess the real winner of the Super Bowl nine out of thirteen times. Now EA wants you to know that it also correctly chose France as the winner of this year's World Cup. EA ran a simulation this past May that called France as the eventual winner of the real World Cup, using free Russia World Cup DLC available in April. The company also tallied up stats from the 406 million virtual games played by FIFA 18 owners, including one billion goals and 1.7 billion keeper saves. 170 million games were played for Brazil, 153 million with the French team and 81 million for Argentina. The most wins per country included France with 248,000 wins, Brazil with 226,000 and Germany coming in at 105,000 wins. Mobile platforms aren't as precognitive, however. 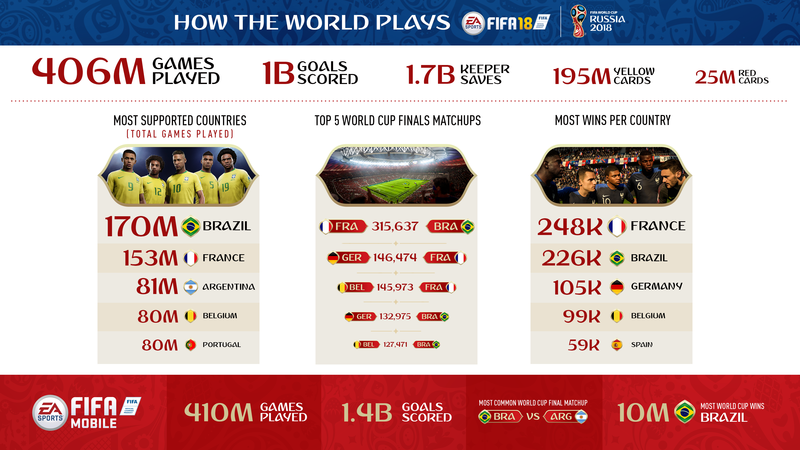 1.4 billion goals were scored across the 410 million mobile games played, and these stats predicted Brazil with the most World Cup wins.